Hutsaliuk, Liuboslav [Hucaljuk, Ljuboslav], b 2 April 1923 in Lviv. Painter and graphic artist. He studied art at Edvard Kozak's studio in Berchtesgaden (1946–9), at the Cooper Union Art School in New York (1949–54), and at the Campanella Academy in Rome. His first important exhibition took place in 1959 in Paris, and was followed by exhibitions in Milan (1959), New York (1962, 1966, 1968), Paris (1963, 1976), and Boston (1973). He is a member of the Audubon Artists, La Société des Artistes Indépendants de Paris, and the Ukrainian Artists' Association in the USA. Hutsaliuk enjoys experimenting with colors. He uses a spatula as well as a brush, and his paintings often look like multicolored mosaics. 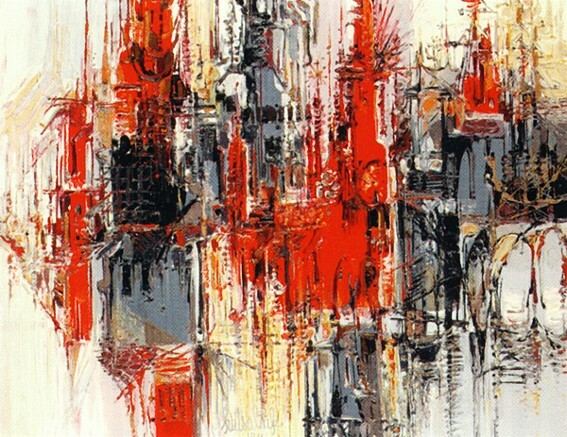 His style is expressionist, but often contains elements of other styles. Its power is derived chiefly from a rich and well-disciplined palette that combines Ukrainian Eastern dynamism with the mannerism of French painting. Hutsaliuk also does graphic art, mainly book illustrations. His satirical cartoons and caricatures have appeared in the journal Lys Mykyta since 1954.